Whether they're freshly baked by your mom, sold door-to-door by Girl Scouts, purchased at a church fund raiser, or presented on Santa's plate by the fireplace, cookies are a big part of American culture. The first American cookie was originally brought to this country by the English, Scots, and Dutch immigrants in the 17th century. Today our simple "butter cookies" strongly resemble the English tea cakes and the Scotch shortbread. It's fun, and easy to make your own island cookies, and give them as tasty tropical Hawaii-style gifts. One way to present them as gifts is to buy a coconut bowl, you know, the little bowls made of half of a coconut. Fill it with tropical cookies, wrap it in a colorful cellophane sheet and put a bow on it. Here's a place to buy the cellophane sheets, bags, etc. : http://www.cellodepot.net/. You can't go wrong with cookies, just ask the "Cookie Monster". These crispy little banana-nut wonton cookies are a great way to impress your friends, and it's very easy. They are filled with a combination of bananas, macadamia nuts, brown sugar and cinnamon, then sprinkled with more brown sugar and cinnamon. I've tried baking these, but frying works better. Eat them while they are hot and crispy, Yum! To make macadamia butter, simply place toasted macadamia nuts in a food processor with a little butter, cinnamon and brown sugar. Process until they are finely chopped, but not too fine. To assemble, fill a small cereal bowl with water. Place one wonton on a plate. 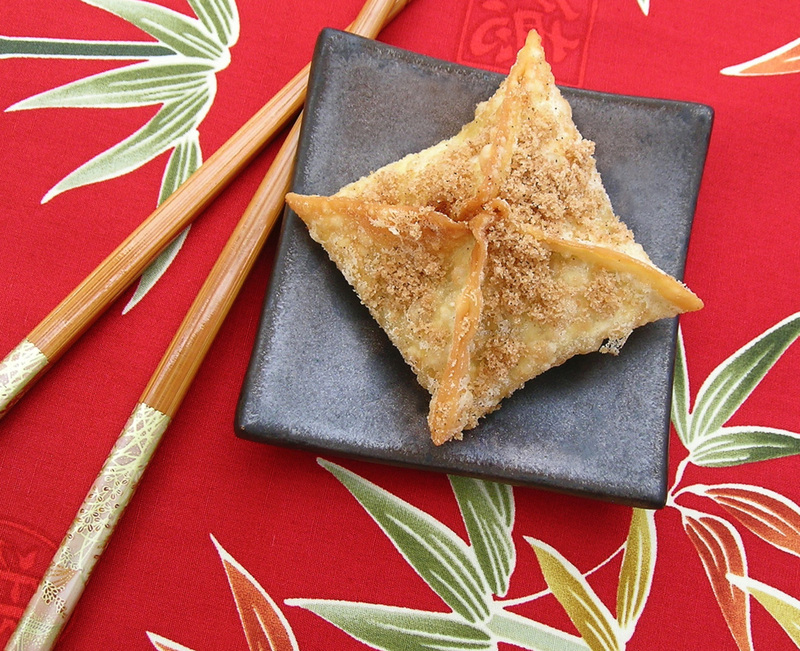 Place two thin slices of banana and about 1/2 teaspoon of macadamia-nut butter in the middle of the wonton. Dip your finger in the water and coat the outside edges of the wonton with a little water. Then pull two opposite corners together and squeeze the points of the wonton to seal. Repeat this step with the other two corners. Finally press together the edges to completely seal the pillow. Continue this process until you have as many pillows as you want. In a small pot or wok, heat about 1 1/2 inches of canola oil to 360˚F. Fry pillows, one at a time, until golden brown, turning often with a slotted spoon. It should be ready when it is a light golden brown, about 1 to 2 minutes. Place hot pillow on a paper towel lined plate and while still hot, sprinkle with a mixture of cinnamon and brown sugar. Make as many as you like, but remember to eat them while they are hot and crispy. Note: Leftover wontons can be easily cut into 1/4" ribbons with a sharp knife, then fried and sprinkled with a little salt. Put these over salads, like Oriental Chicken Salad, or you can sprinkle leftover cinnamon and brown sugar on the fried wonton ribbons and serve them for dessert over orange sherbet. Preheat the oven to 375˚F. Grease 1-2 cookie sheets. With a sharp knife, food processor, or blender, chop the nuts as finely as possible. Melt the butter in a saucepan over low heat. Remove from the heat and stir in the remaining ingredients and the almonds. Drop teaspoonfuls, 2 1/2 inches apart on the prepared cookie sheets. Bake until golden around the edges, about 5 minutes. Cool on the cookie sheets briefly, just until the cookies are stiff enough to lift off. With a metal spatula, transfer the cookies to a rack to cool completely. Makes 18 cookies. Kīlauea is an active volcano on the island of Hawaii. 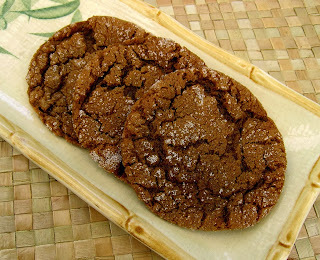 The cracked dark chocolate surface plus the slight warmth of cayenne pepper, and the red sugar dust in these cookies reminds me of the lava from this volcano, and was my inspiration for this recipe. Preheat the oven to 325˚F. In a heatproof bowl set over simmering water, melt the butter and chocolate together, whisking until glossy and smooth. Alternately, the butter and chocolate can be melted in the microwave (in a microwave-safe bowl) in 25-second increments, whisking between each interval. Cool the chocolate mixture to room temperature. In the bowl of a stand mixer fitted with the paddle attachment (or a hand-held mixer), beat the brown sugar, granulated sugar, vanilla extract and eggs on low speed until well combined. Pour in the cooled chocolate and continue to mix until the ingredients are evenly distributed. In a medium bowl sift together the flour, cocoa powder, cinnamon, chili powder, baking soda, salt and cayenne pepper. Add the dry ingredients to the chocolate batter and mix on low speed until just combined and no visible flour remains. Fold in the chocolate chips with a rubber spatula or wooden spoon. Working in two batches, scoop 12 balls of dough (preferably using a small ice cream scoop with a spring handle, about 1 1/2 tablespoon size) onto a parchment-lined sheet pan, leaving at least 1 1/2 inches of space between each cookie. Bake the cookies, one pan at a time, for approximately 14 minutes, rotating the pan halfway through cooking time. The cookies should be puffy and still fairly soft when removed from the oven. Immediately slide the cookies, still on the parchment paper, onto a wire cooling rack, brush with red sugar dust, so that it goes in the cracks like red hot lava. Cool just a bit before serving, 5 to 10 minutes. Makes about 2 dozen cookies. One day I was looking for a good oatmeal cookie recipe. I started out with a basic recipe and kept adding ingredients until I made it uniquely Hawaiian, just like Granny would make. Alongside a tall glass of milk, these cookies are really delicious, and are easy to make, crispy yet soft and chewy, and full of Aloha. Cream together the butter, and sugars. Add egg, vanilla and molasses, beating well after each addition. In a separate bowl,, sift together flour, soda, baking powder, pumpkin pie spice and salt. Add to above. Stir in remaining ingredients. Note: mixture will be very thick, sticky and hard to stir. Scoop dough out by large rounded teaspoons full (about the size of a golf ball), onto 2 large, un-greased, foil lined baking sheets, leaving about 1 inch of space between cookie dough so they can spread without touching each other. Bake in a preheated 375˚F oven for about 15 to 18 minutes. Halfway through cooking, change the position of the cookie sheets to help prevent burning on the bottom of the cookies. When cooked, slide the hot cookies, with the foil, on to cooling racks to cool for 1/2 hour. Store in an air-tight container. Makes about 18", 2" wide, Chef's Hawaiian cookies. *You can make your own pumpkin pie spice by blending: 3 tablespoons ground cinnamon, 2 teaspoons ground ginger, 2 teaspoons nutmeg, 1/1/2 teaspoons ground allspice and 1 1/2 teaspoons ground cloves, or you can purchase it from: www.penzeys.com. 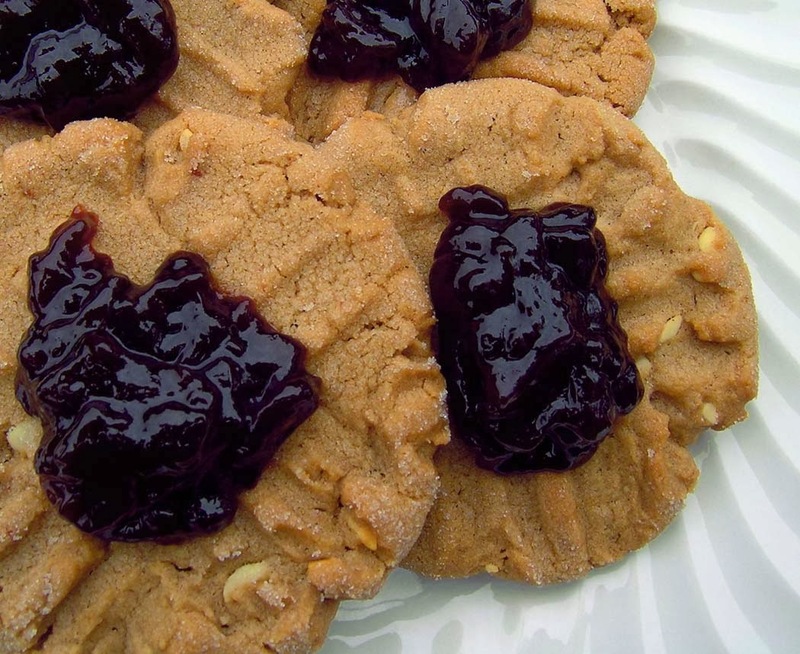 This spice makes a great gift, along with this cookie recipe. It can also be used in your pumpkin pie recipe, mixed into applesauce, as a topping for sweet potatoes, mixed into pancake or waffle batter, stirred into oatmeal, or sprinkled in your coffee for a pumpkin spice latte. Penzeys.com also sells spice bottles. Mango and macadamia nuts are Hawaiian culinary icons. Combine this with a spicy icing and you have a tropical blend that everyone will love. For the Cookies: In a large bowl, beat the butter, sugar, vanilla, cinnamon, and salt with an electric mixer until light and fluffy, about 2 minutes. Beat in the egg. Stir in the flour until just blended. Mix in the chopped mango and toasted macadamia nuts. Transfer the dough to a sheet of plastic wrap and shape into a log, about 12-inches long and 1 1/2 inches in diameter. Wrap the dough in the plastic and refrigerate for 2 hours. Preheat the oven to 350˚F. Line 2 heavy baking sheets with parchment paper. Cut the dough log crosswise into 1/4 to 1/2 inch-thick slices. Transfer the cookies to the prepared baking sheets, spacing evenly apart. Bake until the cookies are golden around the edges, about 15 minutes. Transfer the cookies to a wire rack to cool completely before icing. For the Icing: Place the confectioners' sugar in a medium mixing bowl. Gradually whisk in milk, then cinnamon, cloves and ginger, until the mixture is of drizzling consistency. Place a wire rack over a baking sheet. Using a spoon or fork, drizzle the cookies with the icing, allowing any excess icing to drip onto the baking sheet. Allow the icing to set before serving, about 30 minutes. Makes about 2 dozen cookies. Ginger bread and ginger snaps all wrapped up in these spice cookies. They are one of my favorites. Combine the butter and 1 cup of the sugar in the bowl of an electric mixer. Beat until light and fluffy, 5 minutes. Beat in the egg and molassas. Sift the flour, soda, cinnamon, cloves, nutmeg, ginger, and salt together onto a piece of parchment paper. Add the butter mixture, beating just until combined. Cover with plastic wrap and chill for 2 to 3 hours. Preheat the oven to 350˚F. Place the remaining 1/2 cup sugar in a pie plate. Shape the dough into walnut-size balls and roll in the sugar. to coat. Arrange 1 1/2 inches apart on parchment paper lined baking sheets and bake until cracked and dry but still soft, about 15 minutes. Cool on the baking sheets for 5 minutes, then transfer to cool on wire racks. Makes about 4 dozen small cookies. Pineapples are a symbol of welcome and friendship here in Hawaii. I think your friends will welcome these beautiful Pineapple Star Cookies. Whisk together the flour and baking soda in a medium bowl and set aside. Cream the butter and sugar together on medium speed. Add the egg the vanilla, the pineapple, and the pineapple juice and beat until smooth. Slowly add the flour mixture and continue to beat until just combined. Place a tablespoon of cookie dough onto an ungreased cookie sheet and press down on dough to form a 2" circle. Place 1/2 of a Maraschino cherry into the center of the dough. Cut a pineapple ring into eight equal pieces and press 5 of the pieces into the top of the cookie. Repeat with the remaining cookie dough, cherries and pineapple rings. Bake at 300˚F for 15-18 minutes or until very lightly browned. Makes about 2 dozen cookies. To make caramel sauce: Mix the water, sugar and light corn syrup in a large heavy-bottomed saucepan. Cover and cook over low heat until the sugar dissolves. Increase the heat and boil uncovered until the sugar turns a medium brown, about 15 to 20 minutes, stirring occasionally with a wooden spoon. Watch it carefully at the end, as it will go from caramel to burnt very quickly. Stand back to avoid splattering, and gradually add the cream and vanilla extract. Simmer until the caramel dissolves and the sauce is smooth and thick, about 2 minutes. Drizzle sauce between the pineapple slices of each cookie. Makes 1 1/2 cups of sauce. I'm mad about the famous Moloka'i iced drink served at coffees of Hawaii called a "Mocha Mama". These cookies have the same combination of sweet mocha flavors. Preheat oven to 350°F. Grease cookie sheet and set aside. Combine, flour, soda and salt in small bowl, set aside. In a large bowl combine butter and sugar until smooth. Add eggs one at a time, blending well. Next add vanilla extract and the espresso coffee. Add the flour mixture slowly, 1/3 at a time, until well blended. Mix in the chocolate and fold in the nuts. Drop 2 tablespoons batter onto the prepared cookie sheets. Allow room for spreading. Bake 12 minutes. Remove from pan and place on wire rack to cool. To make Icing: Sift sugar, cocoa and salt. Cream butter and shortening with vanilla. Gradually add sugar mixture alternately with coffee until the mixture is of drizzling consistency. Place the wire rack over a baking sheet. Using a spoon or fork, drizzle the cookies with the icing, allowing any excess icing to drip onto the baking sheet. Allow the icing to set before serving, about 30 minutes. Makes about 3 cups of icing, and 2 dozen cookies. Tahitian limes are the variety of the limes found here in Hawaii, but you can use whatever you have for this recipe. These cookies are irresistible, with a chewy butteriness and a big hit of lime. Beat butter, 1 1/2 cups sugar, and lime zest on medium speed with an electric mixer fitted with a paddle until lightly creamed. Add sour cream, and beat just until blended. Stir in egg yolks and lime juice, scraping down sides of bowl. Add salt, baking powder, and flour, and beat until blended. Chill dough 1 hour. Preheat oven to 350°F. Line 2 baking sheets with parchment paper. Place remaining 1/2 cup sugar in a small bowl. Shape dough into 1-inch balls. Roll in sugar, and place on baking sheets. Bake for 20 to 25 minutes or until edges begin to brown; bottoms will look light golden. (For crispier cookies, bake a few additional minutes.) Remove to wire racks to cool. Note: *Remove eggs from refrigerator, and place in a bowl for 30 minutes. To make the icing: whisk together the powdered sugar, lime zest, and lemon juice until smooth. Once out of the oven, allow cookies to cool completely on a wire rack before icing. Using a fork, drizzle glaze over the tops of each cookie. Let sit 1 hour to allow glaze to firm up. Makes about 2 1/2 dozen cookies. Mango is the most popular fruit in the world, and Hawaii has the best mangos. Hawaiian chocolate has a unique flavor and is produced in the Kona region of the Island of Hawaii. Combining the tropical flavor of mango with the classic chocolate chip cookie, makes this a cookie with Aloha. Preheat oven to 350˚F. Line a baking sheet with a Silpat or parchment paper and set aside. Cream butter, sugar, and brown sugar until it is light and fluffy, about 3 minutes. Add the eggs and vanilla extract. Beat for an additional 2 minutes. In a medium bowl, whisk together the flour, salt, baking soda, and baking powder. Add the dry ingredients to the wet ingredients. Mix until combined. Stir in the chocolate chips until well distributed. Gently fold in the mango chunks. Drop about 2 tablespoons of dough or use a medium cookie scoop and plop the batter onto prepared baking sheet. Bake for 12-14 minutes or until the edges are nice and golden brown. Remove from heat and allow the cookies to stay on the cookie sheet for an additional 2 minutes. Transfer cookies to a wire cooling rack and cool completely. Makes about 3 dozen cookies. Apple bananas are small bananas that grow here in Hawaii. They have a tang to them, similar to apples, and give these chocolate chip oatmeal cookies a delightful tropical flavor. Unfortunately you'll have to come to Hawaii to buy apple bananas, so just use regular bananas if you don't live here. In a medium bowl, whisk together flour, baking soda, and salt. Set aside. In a large mixing bowl, combine butter and sugars, mix until smooth. Add in vanilla extract and egg. Next, add the banana. Beat well. Slowly add in flour mixture until just combined. Stir in oats and chocolate chips. Drop cookie dough by heaping tablespoonfuls 2 inches apart onto baking sheets that have been lined with parchment paper or Silcone baking mats. Bake at 350 degrees F for 15-18 minutes or until golden. Remove cookies from pans; cool completely on wire racks. Makes about 2 1/2 dozen cookies. Puff pastry really makes these pin-wheel cookies flaky, buttery and wonderful, and easy to make. They are great with a hot cup of Kona coffee in the morning. Defrost puff pastry according to instructions. Lightly cover work surface with flour and roll out puff pastry. Brush puff pastry with melted butter. Sift brown sugar and cinnamon and sprinkle on top of puff pastry. Place toffee bits, chopped macadamia nuts and chocolate chips in a bowl and toss. Sprinkle mixture on top of brown sugar and cinnamon. Starting from the bottom, roll pastry into a log. Brush top edge with egg wash to seal log. Brush egg wash all over log. Slice log into 1/2 inch pieces. Place pinwheels on parchment-lined baking sheet, leaving 1" of space between cookies for expansion. Bake at 375˚F for 14-16 minutes or until pin-wheel cookies turn golden brown. Cool on a wire rack. Makes 1 dozen cookies. These rich and buttery coconut shortbread cookies are great for gift giving... if you can stand to part with them, and they are very easy to make! Heat oven to 250˚ F. Spread the coconut evenly on a baking sheet, transfer to the oven and bake until just golden, about 10 minutes (keep an eye on the coconut so that it doesn't burn. Set aside to cool. Cream the butter until smooth. Add granulated sugar, vanilla, and coconut extract (if using), creaming again until smooth and slightly fluffy. Sift flour and then measure the 2 cups of flour. Add salt to flour and sift again. Gradually add to the creamed butter mixture until you have added all the flour and mixture is smooth. Mix the toasted coconut into the cookie dough. Shape into a one and half (1.5) inch diameter roll and wrap in plastic wrap. Refrigerate until it the dough is firm, about 2-4 hours, or for several days until ready to use. May be frozen for later baking. Using a sharp knife, cut 1/4 inch slices from the cookie dough roll and place on a very lightly greased cookie sheet, about 1 inch apart. Bake at 300˚F for about 20 minutes, until a light golden brown at edges, but not browned entirely across the top. Cool cookies on sheet just until they are set, easy to remove and have cooled slightly, usually about 2 to 3 minutes. Remove cookies with a spatula and place on the 1 cup of powdered sugar that you have sifted onto a piece of wax paper or similar surface. Cover cookies with powdered sugar on all sides by sifting more sugar over them or "rolling" them in the sugar. After they have cooled and the powdered sugar has "set", you can coat them with more powdered sugar if you would like. Cool completely and then store in an airtight container. Makes 36 cookies.